When grocery stores or supermarkets serve their customers, their duty doesn’t end at the checkout line. When grocery stores or supermarkets serve their customers, their duty doesn’t end at the checkout line. In fact, a grocery store should always be on the lookout for new and unexpected ways to connect with their customers. Although weekly flyers can highlight the latest items on special sale for a given week, that shouldn’t exclude other crucial information, such as tips for meal planning. First of all, grocery stores should encourage the customers to start by creating a coherent plan. 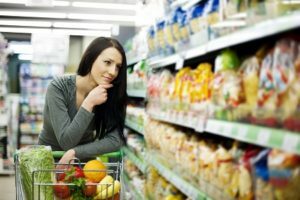 Knowing what is on the menu can help them decide what is essential and what is incidental when it comes to the visit the store. It’ll also allow them to save money since they can formulate a sensible budget and reduce the amount of money they spend on food delivery services. Whether a trip to the grocery store is made in weekly intervals, or in small forages every single day, creating a plan produces something to guide everyone’s efforts and cravings before the next visit. The next step is to show off the plan. Having one in place won’t make much of a difference if no one can see it. Thus, grocery stores – and the consumers they serve – should account for this accordingly. By displaying the written plan on the refrigerator, a clear reminder of what’s need and what is in the works lets everyone know what they’ll be eating. This method will also cut down on unnecessary spending. Weeknights are bound to be busier than weekends. If if the only time your customers can come to your store is on the weekends, that doesn’t mean they don’t care about cooking delicious, filling meals. That said, it’s better to stick to the basics on busy days; these are old standbys that can be served up in next to no time while more adventurous and complicated meals can be reserved for special occasions or when there isn’t as much to do. By recommending to their customers to incorporate more leftovers, they can also help reduce food waste. Every single night of the week doesn’t need to have a brand new entree for it, even when the freshest, crispest salads are included. Leftovers are fantastic ideas for grab-and-go lunches or a way to cut down on stress when no one has the enthusiasm to cook at the end of the week. WANT THE FRESHEST HYDROPONICALLY GROWN PRODUCE? CONTACT US TODAY! This entry was posted on Thursday, February 15th, 2018 at 8:28 am. Both comments and pings are currently closed.